Here we have the 228 Combi gas boiler with a 3 year warranty. 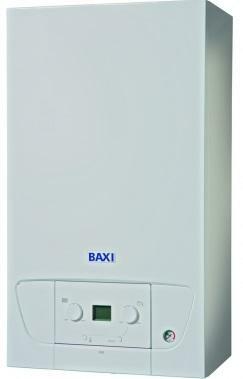 This offering from Baxi sits conveniently on the wall and is highly reliable and equally efficient, coming in at 89% with an output of 28kW rated B for heat. This boiler is nice as it will slide easily into a space of just 290mm making it a perfect boiler for those smaller properties. This boiler hides the pipework well, so will not look unsightly sitting at eye level in your kitchen or airing cupboard. You have a lot of flue options with the Baxi 228 Combi, including different flue lengths, bends, and accessories so it can be installed pretty much anywhere. To increase the performance of this boiler further, you have a slew of extras including a digital 7 day programmable room thermostat and a plug in 24hr digital timer.